It’s not often a little piece of Australian History, really an Australian Icon, passes so close by, so I had to go and check it out! 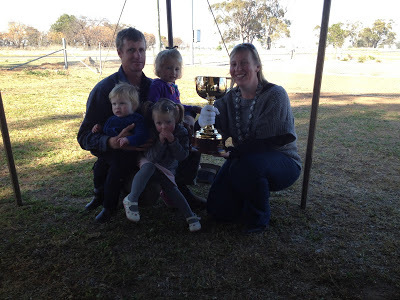 Yesterday morning the Melbourne Cup was coming to a breakfast at the local pub. 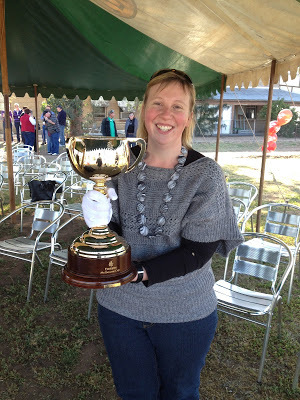 The local community served up bacon and egg rolls with a cuppa for breaky and you could see the real Melbourne Cup up close and personal, as well as hold it if you wanted to. Of course, not one to miss out on an opportunity I put the Muddy Organiser on the bus and carted the other 3 kids to the pub for breakfast to see something they probably won’t get to see up close again. It weighs just over 4 kgs, is made up of 44 pieces hand welded together, it is made of 24 carat gold with a wood base. Each year they make a new cup so the winner gets to keep the year they one, they have almost finished making the one for the 2013 winner. This year I can proudly say I held the cup that will get presented to the winner at about 3:20pm on the 6th of November 2012. The cup travels with an entourage, including a security guard who instructs you specifically on how to hold it. You are allowed to hold the stem, but only with the gloved hand, and your other hand must sit under the base to support the weight. The security guard got very nervous as Muddy Bubby kept reaching for the cup and trying to put his sticky hands on it. Very sternly he said ‘the kids make me nervous, please do not let them touch it’. 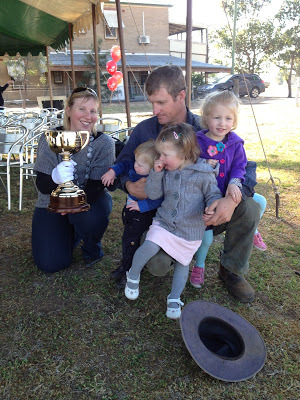 They have a couple of PR people and we were lucky enough to have a jockey who has ridden in the cup 10 times and won 3 Melbourne Cups, he gave a lovely talk about his history and the races he rode in. 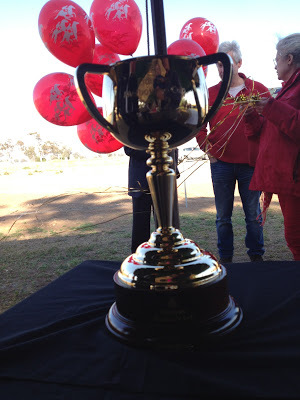 We were also given a talk on the history of the cup, now I missed most of the talk thanks to the Muddy Kids, but one on one the entourage were lovely to chat to and were more than happy to share their stories and knowledge of the cup. Definitely not my normal Monday morning, and not something I’ll forget any time soon. This entry was posted in Family, Photos on September 10, 2012 by nat.